Beauty and diversity, lights and shadows of the homosexual revolution. Chueca is a neighborhood with both old and recent history. 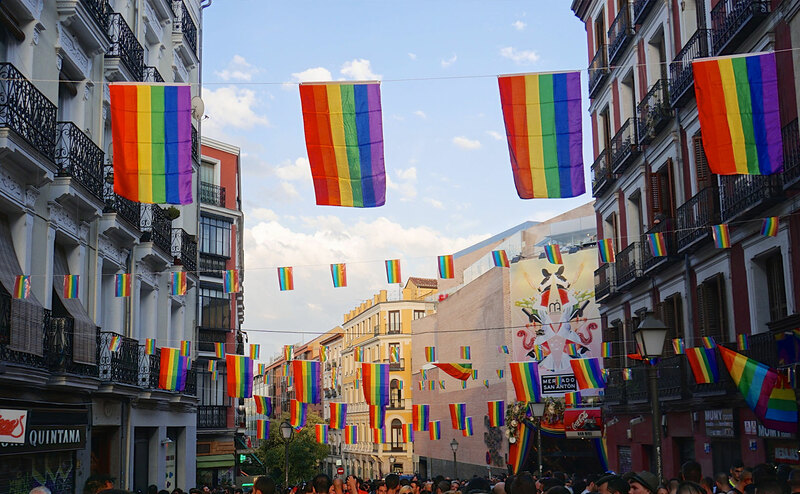 The traditional neighborhood has become an example of coexistence, a melting pot for new trends, and Spain’s gay neighborhood, a role model for other European’s Capitals neighborhoods. With this exclusive tour, we want to celebrate the importance of the pioneer women who created the neighborhood that we know today, by visiting some of the first daytime gay shops like the Berkana Library. We will finish our journey taking a drink in one of the most iconic historical bars in the neighborhood. Point of arrival: Pedro Zerolo Square. Area visited: Chueca square, Berkana bookstore, San Antón’s Market, Barbieri Street, Smoke bar, Pedro Zerolo Square.